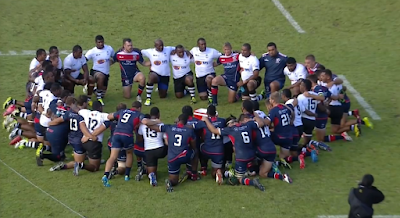 The Fiji Warriors put the sword to the USA Selects Saturday in Montevideo 62-12. Fiji ground out tries against the Americans through tough scrum and lineout work in the first half. As legs tired in second half, the Flying Fijians exploited an exhausted and confused defense to score 38 points. Both teams have prepared this week but the rust was noticeable early. The United States capitalized on a Fiji handling error and Matai Leuta scored a quick unconverted try. Two minutes later Fiji blocked a JP Eloff clearance kick and Iferemi Tovilevu scored underneath the posts. Each team traded a variety of corner and stab-through testing the ability of the coverage. Mikey Te’o displayed his marvelous step in several of these sequences but the USA struggled to find continuity from his forward progress. A USA turnover within their own half gave Fiji the opportunity to quickly move the ball wide. The quick-handling saw flyhalf Alivereti Veitokani score underneath the posts. 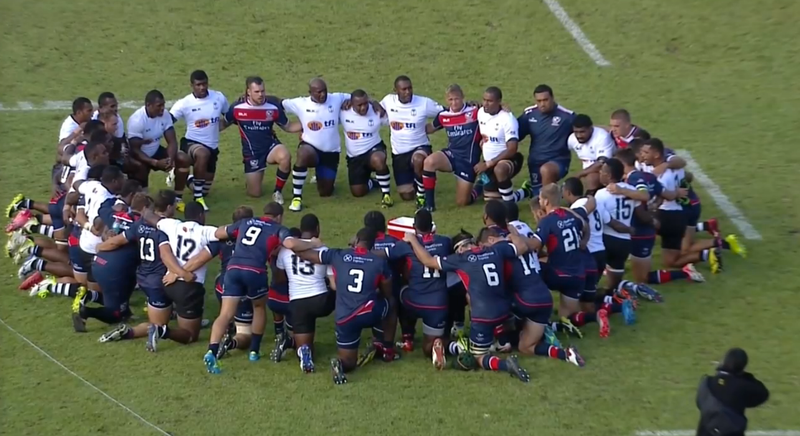 The United States scrum suffered all day, as the Fijians imposed their will on Mason Pederson and Demecus Beach. Pederson came off with an injury in the 26th minute. Immediately his replacement Chance Wenglewski was pinned by Mesake Doge. With a stable platform, number 8 Vasikili Mudo crashed over to score. Several promising American forays into the Fijian half were lost through careless handling and poor decision-making. The young side frequently lost their composure under fortuitous and difficult situations. Martin Iosefo, despite fine play in defense and attack, was carded for attempts to slow down the Fijian pace at the ruck. Fiji took advantage and pressed the Americans at another scrum minutes later, earning a penalty try for an American infraction. At half time, the Selects were down a surmountable 24-5. But any attempt to claw back became more difficult when Demecus Beach, under pressure, intentionally collapsed a scrum and carded. The Americans were able to capitalize, despite his absence, when Stephen Tomasin dummied off the base of a 5 meter maul and snuck through for a try. The Selects did not help themselves during the power play. Down a man, an ill-advised offload went to ground. The Fijians, famous for their ability to transition from defense in offense in Sevens, seamlessly pushed the ball away to wing Lepani Raiyala. The big man kicked ahead for a second chaser to collect. Desperate American defense tried to organize but quick movement across the field found a strike runner in Eremasi Radrodro to score. At this point, the barn door came undone and the Fijians scored seemingly at will. The Americans struggled to match the Fijian pace and could not bring down runners quickly or slow the time between phases. Replacements started to come on for the selects, including flyhalf Ben Cima. The Rocky George pivot threw an ill-advised cut-out pass converted into an intercept try. But Cima brought more shape and consistency to the American attack. Despite this, the Americans continued to lose the ball carelessly through 50/50 passes and poor ball placement in the tackle. The Warriors feasted on these opportunities and quickly took advantage of a disorganized American defense to ring in 62 total points. This loss will sting for many on the young squad. But the Americas Pacific Challenge is the perfect venue for the United States developing players to learn decision-making and composure at the international level. Better to force a pass against the Fiji Warriors than against Canada in a World Cup qualifier. But the technical deficiencies must improve. At the scrum, the Selects went backwards consistently and were humiliated underneath their own posts. This is a matter of pride and it is imperative that the Selects, and also the Eagles, forwards start treating it as such.